Set up speakers for a meeting. Scheduling speakers and keeping the site up to date can help both the speaker coordinator and members to plan for upcoming speakers. Members will be able to see when speakers are scheduled and when there is availability. There are 2 steps to make sure you are showing the speaker on the calendar and capturing the needed information. In order to view at a glance if a speaker has been assigned to a meeting on the Meeting and Event page and to aid in scheduling speakers, add the speaker name to the meeting title so it will show in the site calendar. 2. 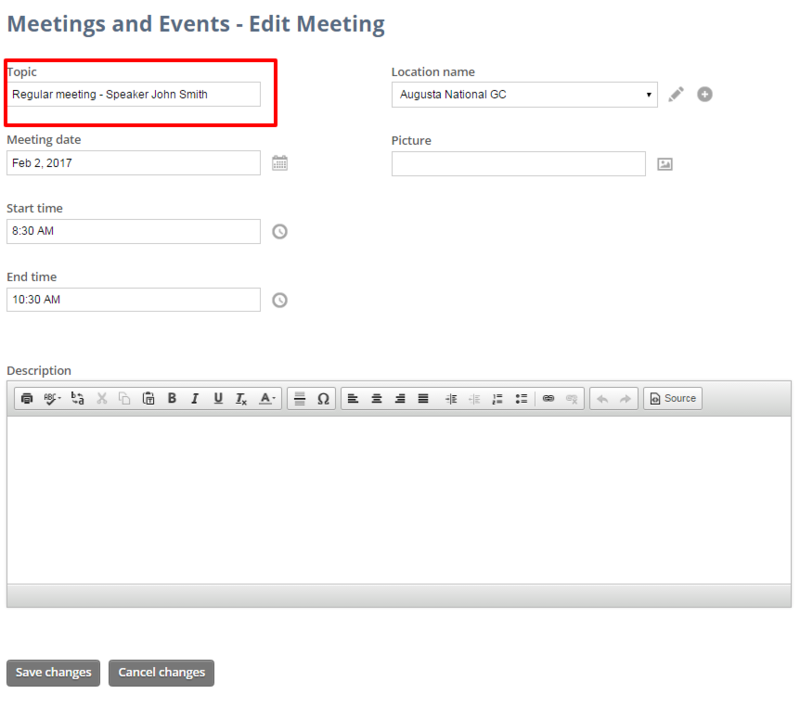 Locate the meeting to add a speaker, click the three dots to display more options and select the edit option. 3. Edit the Topic textbox to include Speaker and name of speaker. This will show on the Meeting and events page as well as the meetings listings on the public website. For example: Regular meeting - Speaker John Smith. 4. Scroll to bottom of page and click the Save changes button. When you click on the meeting and see the meeting detail page, the speaker role should show under the Meeting Assignments. If Speaker role is not shown under, click the Add new button in the red Administration bar. In the Add New Assignment box, enter Speaker in the textbox. Note: After adding the speaker assignment, you can click the Manage recurring button to make the role or assignment recurring. By indicating Recurring, the meeting assignment will automatically add the assignment to any new meetings created. 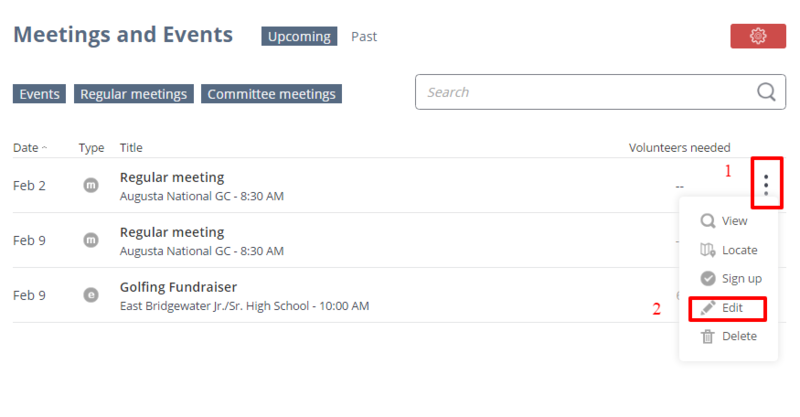 Ensure that the Meeting and events listing page is shown. If not, click the Meeting & events icon on the navigation menu on the left. 2. Choose a meeting and click the title to make changes. 3. Under Meeting assignments, locate Speaker and click the sign up member icon to add a member speaker. 4. Start typing either the first or last name of the member and select name from the autocomplete textbox. 5. Click the Sign Up button. The member speaker name will show in the speaker row. To edit, click the edit icon. To delete the speaker, click the trash icon. 3. Under Meeting assignments, locate Speaker and click the Sign up guest icon. 4. Type the full name of the speaker member in the guest name textbox. 5. Type the email address of the guest speaker in the email textbox. 6. Type any information needed about the speaker in the Notes box. This is a good place to capture contact information such as cell phone or business phone, etc. 7. Click the Sign up button. The member speaker name will show in the speaker row. To edit, click the edit icon. To delete the speaker, click the trash icon.